According to the U.S. Census Bureau, there are 83.1 million millennials in the U.S., representing more than one quarter of the nation's population. Millennials have grown up in a time of rapid change, giving them a set of priorities and expectations drastically different from previous generations. They’re the first generation of digital natives (children who were born into and raised in the digital world). They have an affinity for technology and are used to instant access when it comes to how they work, play and shop. The lines between work and play continue to blur among the younger workforce, as millennials are always connected and can work from anywhere such as the comfort of their own home, the local coffee shop, or trendy offices. With so much information at their fingertips all the time, this generation of workers are looking for meeting and conference experiences that offer something they can’t get on their computer screen. They want an authentic experience that fosters learning and contains elements of surprise. As millennials host and attend meetings and conferences, there is an expectation to create shareable, one-of-a-kind experiences. Both meeting and event attendees want to feel inspired, connected to fellow attendees, and engaged in the overall experience of the event. A program that encourages participation and active experiences is key for creating an experiential meeting. Design and furnishings also play a key role in providing the right environment for these shared experiences. Leveraging principles of design can help planners transition from run-of-the-mill meetings to immersive, impactful experiences. 1. Collaborative Team Environments. Generic “theater” seating for meetings is a thing of the past. Spaces that not only delight the senses, but create a collaborative team environment conducive to learning, networking and brainstorming are what millennials desire in their event spaces. Experiment with different seating arrangements, such as casual seating vignettes and small lounges to make your space feel comfortable and inviting. 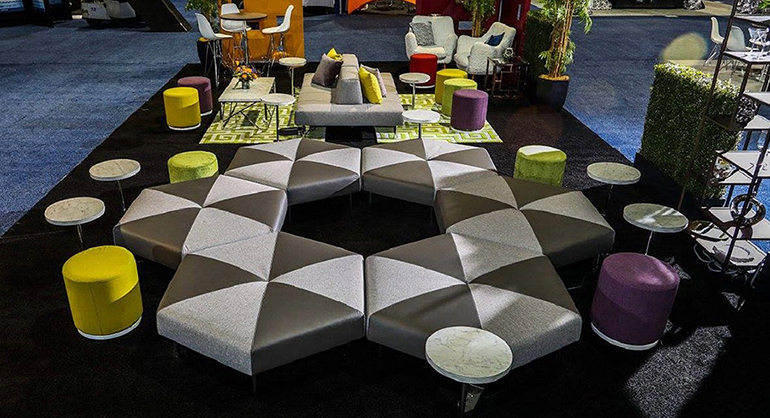 Create unusual lounges using Hexagon Ottomans or Island Sofas that encourage groups to sit informally, collaborate and help break down barriers to communication. 2. Flexibility. Plan your furnishings in a way that allows for easy movement and flexibility. Consider using curved or round seating, such as pieces from the CORT Endless Collection, that encourage a constant flow around the furnishings. Bar table groupings are also a great way for small groups to gather and work impromptu. Planners should also consider incorporating non-traditional seating around café tables or monitors. The Marche Ottomans swivel and can be configured on the fly for campfire style gatherings, plus they add a dose of color to keep the room fresh. Wagner Chairs and Vibe Cubes are great ways to add texture and color to a space while still maintaining comfort and style. 3. Plugged In. Staying connected and charged is a hot button item for this audience. The importance of being connected to mobile devices and maintaining accessibility to charging capabilities cannot be overstated in the current business environment. When attendees rush to find seating by wall outlets to charge their phones or other electronics, it’s disruptive to the overall experience. Instead, incorporate powered seating into your meeting designs. Introduce a variety of powered furniture to your meeting rooms to create communal workspaces that foster a team environment and encourage collaborative strategic planning. 4. Comfortable Breakout Sessions. Comfortable soft seating not only keeps your participants relaxed, but also alert, engaged and more willing to participate. Define large or small breakout areas with Miramar Dividers or Boxwood Hedges to allow for more intimate gatherings within a large room and provide opportunities for branding and signage. Comfortable and energetic spaces encourage interactivity that creates memorable learning experiences. 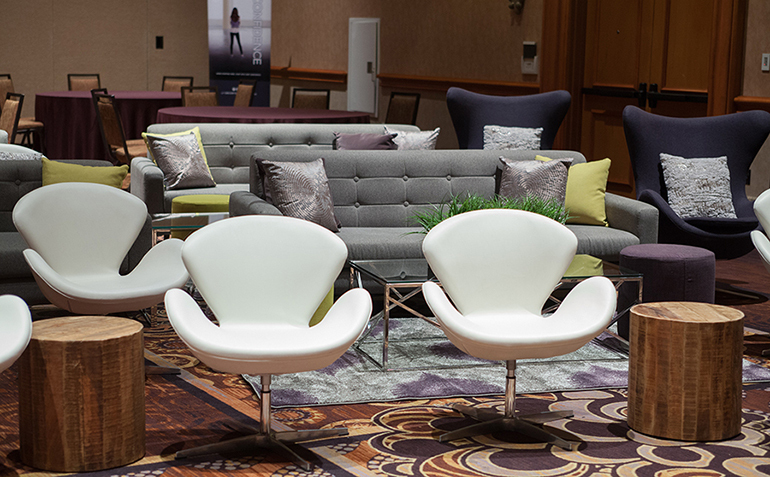 Planners must continually create meetings and conferences that reflect the evolving social landscape and rethink how they develop, design, and deliver events and experiences to leave a lasting impact on attendees. Chances are, they will remember the content better if they remember the meeting. Get Inspired in the New Year with Stylish Design Trends! New Year, New Color Palette!